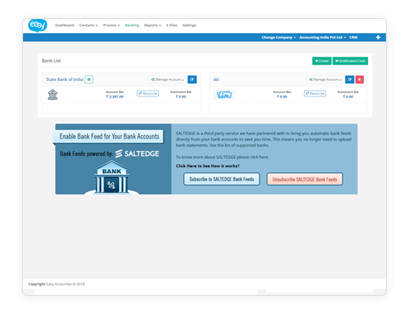 Manage all your bank accounts easily,and keep them up to date. Connect Easy to your bank account or import your bank statement into Easy. Match statement lines from your bank accounts with transactions in Easy. Easy to keep your accounts up to date and accurate. Easy lets you connect your bank account directly to your bank and imports all your transactions from your bank every day. Auto match reconciliation automatically reconcile all your transactions on click of one button. You can also import your statements using CSV format. Easy offers auto matching and rule based reconciliation to make it even faster to reconcile your bank. 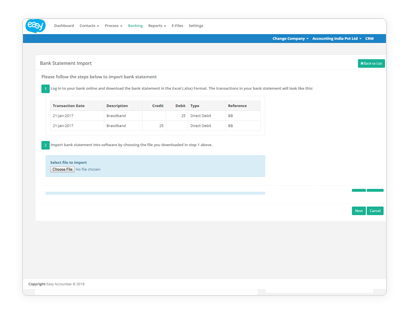 Our bulk reconciliation tool gives you option to reconcile transactions of similar nature in no time by filtering them and defining them only once. 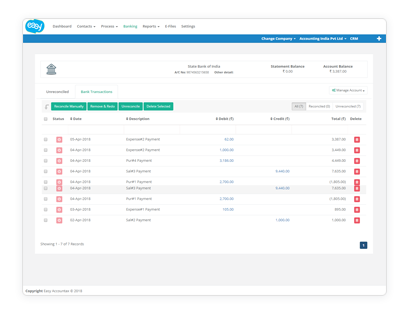 Our reconciliation tool is a mixture of traditional desktop accounting and today’s advanced cloud accounting software. It is making accounting much easier for you. You can teach Easy by creating different transaction matching rules and tell it how to consider particular transaction in bank statement. Easy then compare each transaction imported into the Easy against the set of rules created and apply the rule which matches the most making reconciliation just a click away.